MySpace Music will offer paid-for, DRM-free MP3 downloads (no details on pricing or quality), ad-supported music and video streaming, ringtones for cell phones, concert ticket sales, and merchandise. When it’s up and running, MySpace Music will be a direct competitor to iTunes, now the No. 1 music retailer in the U.S., as well as other online music stores such as AmazonMP3. Analysts are noting that MySpace Music is a step in the right direction for music companies, but that “Apple will not be affected for the first few years because Apple’s iTunes store lives on the strength of Apple devices,” Forrester Research analyst James McQuivey told Reuters. That may be true. For now. But do not underestimate the influence of MySpace on bands and their fans. 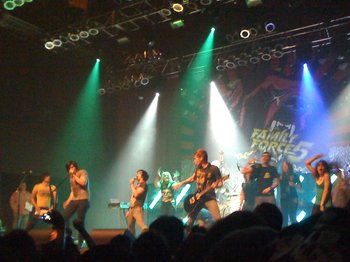 Throughout the Family Force 5 and The Maine show, fans of the two bands were constantly taking pictures with cell phones and digital cameras. Heck, band members were taking pictures of the crowd in between songs. And where do all these pictures, stories, and interactions end up? On MySpace. 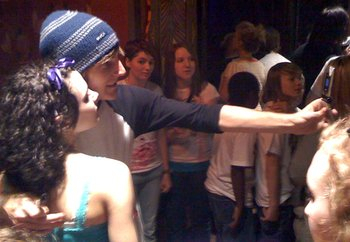 “Email me your pictures so I can put them on my MySpace page,” one girl told another as they were leaving. For now, iTunes has the awareness and brand for legal digital music downloads, but what happens when word spreads throughout the MySpace community that you can buy the music of the band you just saw in concert at MySpace Music — or directly from the band’s MySpace page? That music, by the way, plays on any digital device, including the popular iPod and cell phones. And streaming audio and video playlists can be shared with your MySpace friends. What happens when bands start recording their shows and making a cut or two available for purchase or streaming at MySpace Music or from their MySpace band page? What happens when the line between bands and fans blur so much that a record label’s involvement is nearly invisible? Or that it really doesn’t matter where you buy your music — MySpace, iTunes, AmazonMP3? What happens if MySpace gets it right and steals a page or two from iTunes and creates a pleasant shopping experience, with all the niceties of iTunes like easy search, organization, ratings and recommendations, celebrity playlists, Essentials and Originals, and gift cards so kids don’t need a credit card to buy music? “It (MySpace) goes from being a promotional vehicle to being a commercial vehicle,” MySpace Chief Operating Officer Amit Kapur said on a conference call announcing the joint venture. Judging by the design of MySpace band and individual pages, which are horrid by most standards, a better shopping experience than iTunes seems incredibly unlikely, but kids are notoriously hard to read, brand fickle, and have been known to change their minds when something else comes along. It’s up to MySpace and the record companies to make MySpace Music a compelling product. Apple, more than most companies, knows this. As kids left the venue tonight, many were given a $30 free downloads card from iTunes. Just in our party, the kid and her friends received $150 in free music — a sign that Apple and iTunes isn’t going to take MySpace Music lightly.